June 28th, after 9 p.m. on the street in front of my house. This is Fabia and her solo cub. He is adorable. My neighbor took this photo from her front porch with a nice camera. Not her iPhone. It was a cloudy and gloomy evening so I am so pleased she got this photo. I saw her yesterday morning at the bottom of our mountain but didn't even know she was up on our street until I heard my dog barking from the top of our driveway. It was a bark that said an animal had been spotted but we had seen a bull moose earlier so that was what I thought I would see. Fabia has been viewed in our mountain community for several years. She was originally called "Fabio," until it because obvious the he was actually a she. Just a quick post. I need to get packed up and drive into Anchorage for Breakfast Club. Raining all day today so a perfect day for sewing with friends. This is what our fire pit looked like at the start of the 2017 non-snow season. Cute...but I am a quilter that loves big borders and this little circle needed more. A new outer border was slowly added. Then, of course my mind kept wanting to add a connection to the rest of my landscaping. So I marked an additional area to dig up and add rock. I'm calling the fire pit officially complete. I am not good at making beautiful, lush lawns. My current thought is to bring in top soil next spring, level out the lawn and reseed. The dirt around our house was sprayed with hydro-mulch five years ago but was left to go wild so there are plenty of weeds in the mix. Any advice about cultivating a lush lawn is greatly appreciated. Our summer is turning out to be cloudy and cool which is pretty much normal. We are spending quite a bit of time sitting around the fire pit in the early evenings. So my next summer project was to stain the new awning extension over our deck door. We had it built in March and we are so happy to have it. We didn't realize when we built the house how often we would use the deck door. With two dogs, it is our main door and when it was raining or snowing we were getting hit with moisture whenever we opened it. Just took a few hours. The day started out sunny but almost as soon as I started working on it the dark clouds began to gather. I stained the areas that would be exposed to the rain first and hoped the stain would set enough before the rain came...if the rain came. Oops...I see in this photo that I left some of the blue painters' tape where I need a ladder to reach it. Most importantly...it is done and looks great. We had a few light sprinkles but nothing that was bad for the new stain. I don't think the "garden boxes" are going to get much action this summer. I did plant raspberries in one section. 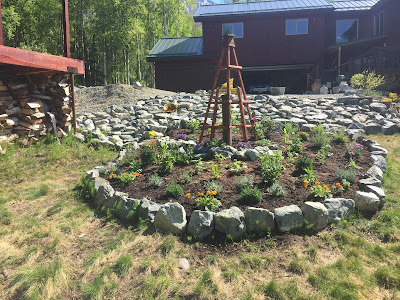 I still have some rock work to finish around the two bottom garden beds. You can also see our lovely and important generator that powers half of our house when we lose power. My studio is hooked up to the generator so the quilting can always continue. We do lose power in the winter time when there is heavy snow or high winds. I have had a little success with one of the unique plants we can grow in Alaska, a blue poppy. They are pricey plants, about $15 for one plant. I'm keeping my fingers crossed that it winters over for many years to come. Breakfast club is this Thursday so I hope to spend some time at the sewing machine. I have two existing projects I am planning to take instead of starting the official new project...but I just might change my mind. 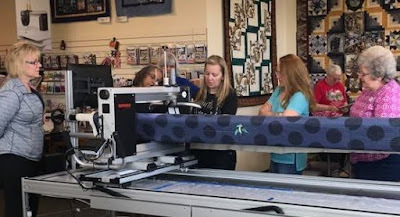 I had an excellent adventure with several quilters from our Breakfast Club group. 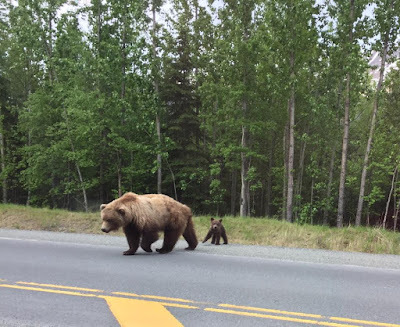 We did a road trip to the Kenai Peninsula. 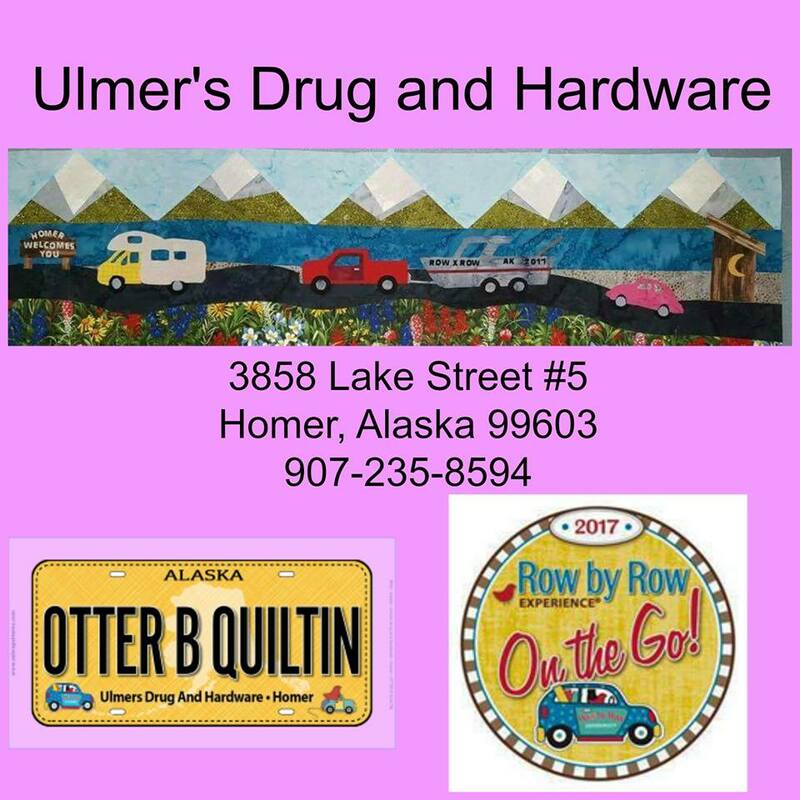 We absolutely have the most wonderful quilt shops in Alaska. We started early in the morning on Tuesday, shopped at four stores on our way to Homer, where we spent the night at a B & B.
Wednesday morning was the first day of the Row by Row season. 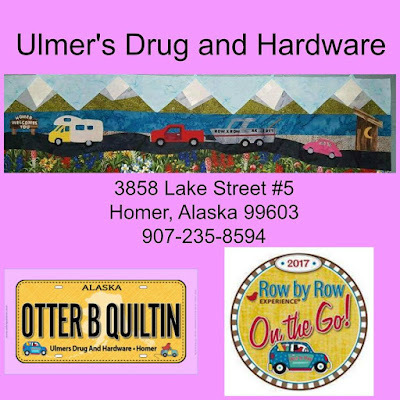 We were on the road by 8 a.m. since Homer has one quilt shop inside a hardware store that opens at 8 a.m.
After stopping for coffee and driving for an hour and half we were in Soldotna for our second pattern. I purchased kits of all the patterns since they were soooo cute and many had laser cut pieces. Here is a look at the actual kit with the laser cut pieces. Fantastic detail. Not all the cut sections have been removed on the little pieces when you open the kit, such as the middle water piece. 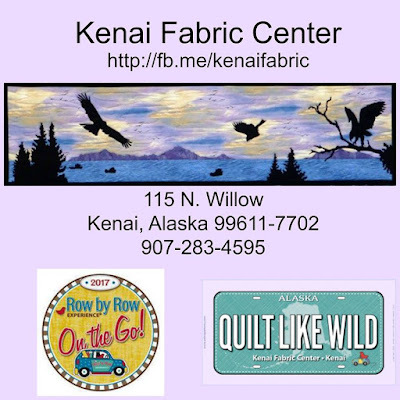 Kenai Fabric Center is like a fabric hoarder's paradise. And I think half the store is batiks. The store does not have sales or discounts to clear out old fabric for new so I saw several batiks that had been released over ten years ago. But the new stuff is there too!!! It is definitely a "destination store." 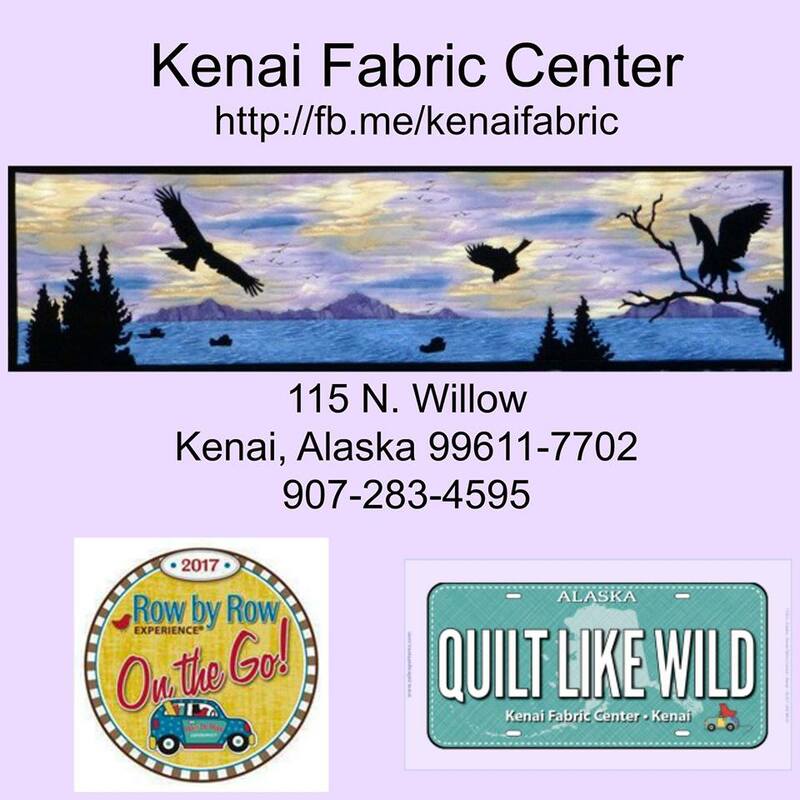 Here's a peek at the Kenai Fabric Center kit. The birds are already on the fabric. It looks like someone drew them in place! I don't know...wish I had thought to ask at the shop if the birds were on the fabric or the shop added them. Some of these shops go to extreme lengths to make the perfect kit. The Bearly Threaded kits came in different colorways with the black laser cut silhouette. Below is the colorway I bought. The waters of the Kenai River in the Cooper Landing area are turquoise so I love this version. 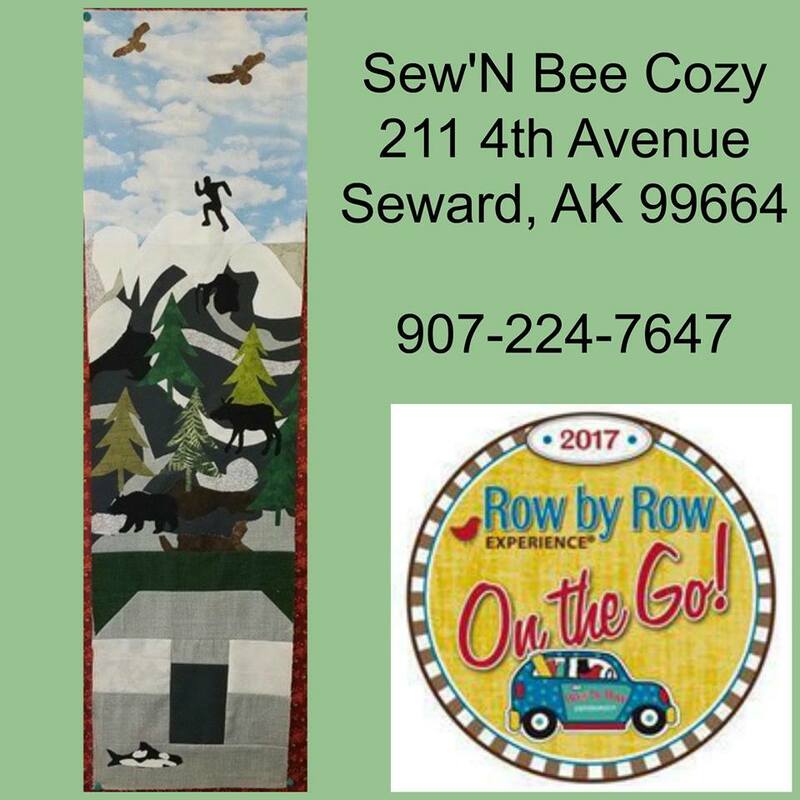 And we ended our trip with a swing over to Seward which has one quilt shop. I had never been to this shop before and thought it was great. Lots of wildlife themed quilt kits at fantastic prices. Their block needs a little explanation if you aren't familiar with Seward. At the bottom is the Sealife Center that is an educational facility. It is also our state's only permanent marine animal rescue and rehabilitation facility. At the top of the block is homage to a race up and down a mountain on the 4th of July every year called, Mount Marathon. It is a challenging race and just making it across the finish line is a real accomplishment. 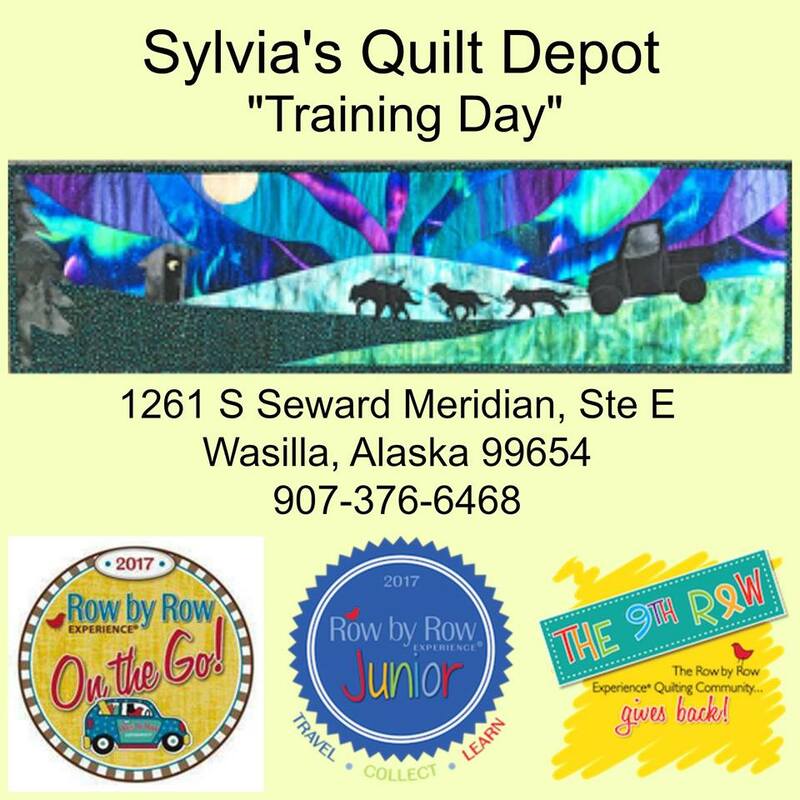 And this morning I was just anxious to run out to Wasilla and pick up Sylvia's pattern. She has a mushing theme going for her Row by Rows with two or three more years already designed. This pattern also might need a little explaining if you aren't familiar with dog mushing. When we lack snow on the ground, mushing dogs still need to train so mushers hook them up to four wheelers or atvs. Pretty ingenious. And I know one of my blog readers will be happy to know, Sylvia had the "Idita Quilt," pins this year and I picked up two for her! All of the above Row by Row kits came with laser cut pieces except the kit from Homer. In an ideal world I would stitch around every laser cut after adhering it in place...that's my plan anyway. We did our non Row by Row shopping in the quilt shops the day we drove down to Homer and then just grabbed the Row by Row kits and patterns on Wednesday so we would have time to drive to Seward before heading back to Anchorage. We made it back to Anchorage by 6 p.m.
One of our Kenai Row by Row trekkers is a flight attendant for Alaska Airlines so she will help us collect kits from Fairbanks, Sitka, Ketchikan and Juneau. 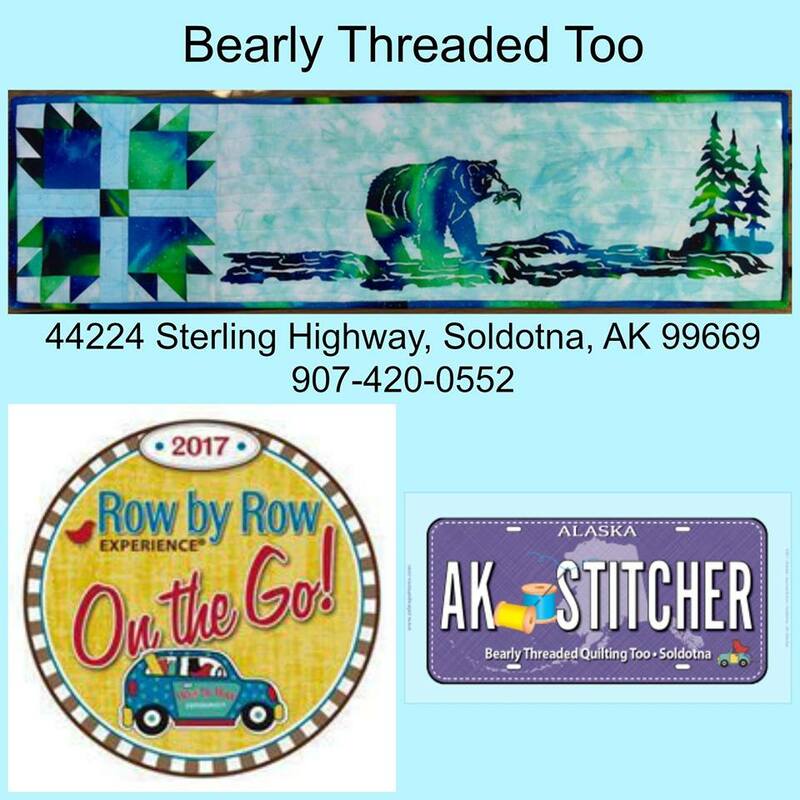 The patterns from my two local quilt shops in Eagle River just didn't interest me...nor did they last year. I certainly have enough wonderful patterns to collect in Alaska. And...I still have four Anchorage shops to visit...maybe tomorrow. I am not the fastest quilter...but just like the tortoise...I am persistent. (That pile of tops needing to be quilted just never gets smaller.) My favorite moment of quilting is when I tie that last knot when stitching down the binding. I always want to jump up and do a happy dance. This pattern is "Perfect Ten," by Swirly Girls. So named because you take ten fat quarters and add border fabric. I used a set of Moda batik fat quarters that had aged so long I didn't remember the name of the set but I'm pretty sure they are a Laundry Basket design from long ago. I loved the batiks but because all of the fat quarters are pretty much of a medium value it was tough to figure out what to make with them. I did blog about this quilt when I pulled it off the quilting frame so I feel like I am just repeating myself...but just in case you missed that post, I'll review a little history. I am thinking of naming it "Practice No. 5," as I pretty much planned to quilt each fabric section differently when I finished piecing the top. It took a few years for the right inspiration to come along but the two new books I bought from Margaret Solomon Gunn with filler techniques was the push I was waiting for on this quilt top. Also, the song, "Mambo No. 5," has been running through my head lately. I have been hoping sites for quilt photo shoots would work their way into my new landscaping. I tried a few out today. My Clematis trellis is coming along but my new plants are only about 18" tall. Great quilt stand! KcKinley and Logan kept walking through my shots (thank goodness for the digital camera age with delete buttons). So...I tried to get them both to pose. Ha! Logan is still too young to stay when I am trying to get him to look at the camera. Kinley is trying to give him some pointers (inside setter joke...pointers) on modeling. I lost my patience and pulled Logan out of the scene. Kinley was very cooperative. Notice the "WOW" wheel. My son, Zack, who collects the antler sheds, made that for me when he was about 11 or 12 on a trip to Grandma and Grandpa's over spring break. The "WOW" wheel is also a "MOM" wheel. I love it! Eli even jacked one of my photo shoots...he was laying on my felt pieces from a Bucilla kit when I came back into the room with my camera. At least he just laid on them and didn't mess them up at all. Since two ladies asked the brand name of the little iron, thought I would mention it is a Clover wedge iron. Also asked by a noreply blogger (check your default settings to change that status) what pattern I was using for the red, white and blue quilt. It is "Chain Log Cabin," from the book, "Moda All-Stars Scraps Made Simple." We are so fortunate in the Anchorage area to have a quilt shop, Seams Like Home, that brings national quilt teachers up to Alaska. In the past, I have been too late to get into a class but I have made a bigger effort to sign up the day the class is announced. Angela Walters last weekend and this weekend Cynthia England. Here is a terrible photo of Cynthia's quilt that won the Houston Quilt show last fall. It is so incredible. I have seen it in a couple of quilting magazines so hopefully you have seen a better photo of this quilt. Or maybe you saw it at Houston. I could look at it forever. I picked option 2, Smokey Mountains. Turns out it is just a little easier than Tranquil Lake. I chose wisely! The first half of the class was construction. This is how far I got. I had a little help, as Cynthia actually used my kit to show some of the piecing. She is a Bernina owner also, so I think she chose me because I had a machine she was comfortable using. 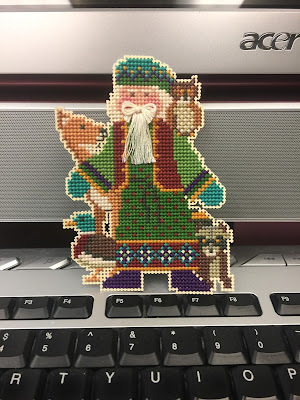 which I bought from the quilt shop at the class. I have a Rowenta travel iron but it is a power hog...uses 1,000 watts which leads to popped fuses when several quilters are using them in one space. This little iron only uses 80 watts and is just perfect. I love it. I also already had the clamp on ironing board that a local quilter designed. You have to press every little seam as you stitch with this technique so very important to have an iron and board so handy. The second half of the class was all about how to take a picture and create a quilt design. I bought her book about this technique 20 years ago...hands on with the author makes a huge difference in understanding the little mistakes that most people make. I now have so many pictures in my head I want to turn into a quilt...I need to stop sleeping. I don't know how else to find time for everything. I didn't get a bear picture yesterday...though we did have black bear in the yard. I was busy cooking dinner so missed seeing him but my husband did see it as we knew some animal was making the dogs crazy. There is a grizzly sow with two cubs in our neighborhood right now...I've only seen other peoples' pictures of her...expecting her to visit us as sometime...though it might be while we are asleep. I did see this moose in our yard last night. Again...the dogs were doing their crazy barking for animal sightings. This moose was running and I waited for a bit to see if a bear was going to be following it but didn't see it. Dog barking doesn't usually get a moose running. but I've seen this mama bear the past two years in my yard. We were hoping she was past her cub-bearing years. The above photo was taken by a neighbor. She was at the bottom of our mountain, near our mailboxes, when this photo was taken. About a quarter of a mile from my house. Below is a photo of her in my yard, May of 2016. And there is a second grizzly sow with two cubs that was in my neighbor's backyard last month. 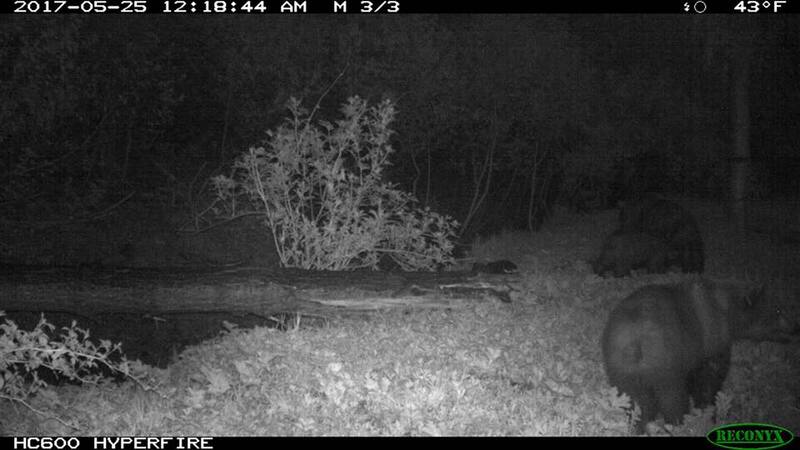 The photo was taken with a motion sensitive trail camera. This neighbor lives directly across the street from me. I woke at 5:30 a.m. this morning to the dogs going crazy because there was a black bear on our deck. 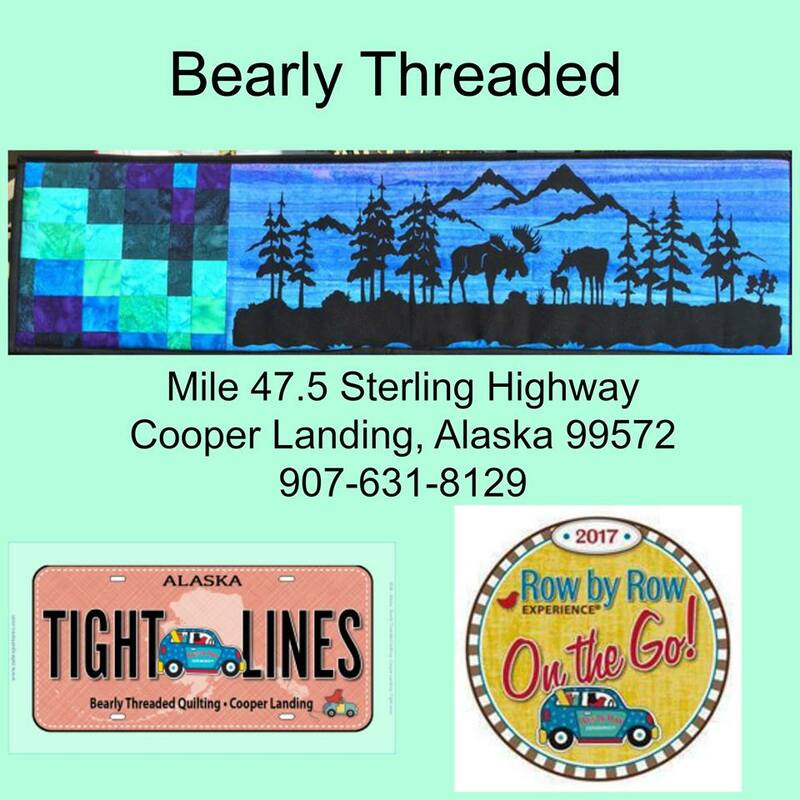 My favorite quilt shop in the Anchorage area, Seams Like Home, brings in national quilt teachers. Saturday morning I spent three hours with Angela Walters doing some hands on with rulers at the quilting frame. Angela is demoing at the machine and I am in the turquoise T-shirt. As usual, when I talk with national quilting teachers...it is always the stuff that isn't included in the official class that often gives me the most memorable learning moments. I would jump at the chance to take another class from Angela. Fantastic, personable teacher with so much knowledge that she gets out so efficiently. 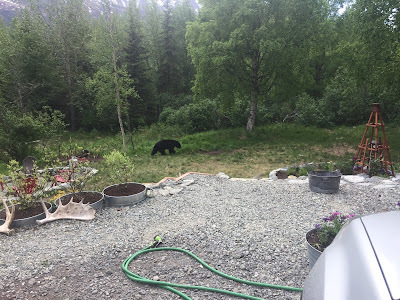 I didn't crop the bear photo...I took it from my car since I saw the bear walking down my driveway on my way home. It is summer time so I have been spending as much time outside as the weather and my schedule allows. I started the rock outline for a perennial flower bed last fall. It was such a delight to plant it this summer! Finished a Bucilla ornament set, Snow Garden. And just this morning I finished making 54 blocks for a log cabin inspired patriotic quilt. Only 16 blocks on my design wall right now. I am so in love with this fabric line in this pattern. It was a batik line from Moda last summer called Fire and Ice. I would never have put all these together and then added black...but it really looks sharp! It is going to be challenging to sew all these blocks together so I might wait for a few rainy days. I wanted to show how my rock and metal tub wall is fairing after its first winter. I lost one tub from the top due to the snow plowing of our driveway but I got it easily replaced and filled with a red twig dogwood which is what is in the other tubs along the top row. The six purple fountain grass plants did not survive. Not too surprising. I replaced them with gold potentilla which I know will winter over as the three orange potentillas are thriving! The firepit is getting lots of use but of course...I have plans to make it look grander...I don't know why I do this to myself...remember...I have that problem in quilting...making everything bigger. I think of my blog as a journal that I share with others. I keep doing it because it really helps me keep track of what I accomplish. I had a couple of days last week when I didn't feel too peppy and I was feeling overwhelmed. (I even took a nap one afternoon...I never take naps!) I know everyone has those days. Looking through my blog makes me feel so much better. I do accomplish a lot... sometimes it takes months or years until there is a final result. Maybe with some of Angela's tricks added to my quilting knowledge...I can make a bigger dent in my quilt top pile.